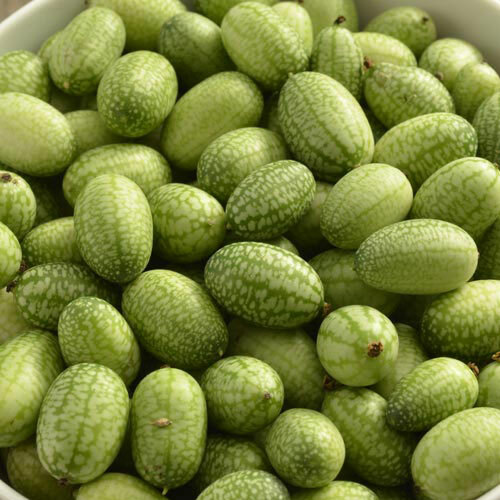 Mouse Melon | Gurney's Seed & Nursery Co.
Miniature oval melons look like tiny watermelons and are surprisingly crunchy, with a refreshing tart taste that's great for pickles, stir fries and fresh salads! Its very attractive ornamental vines are ideal for growing on a trellis. Mouse Melons (also known as Mexican Sour Gherkins) are virtually carefree, have good disease resistance, extremely high yields and are extremely easy-to-grow. 60 DAYS. HeightCan grow up to 10 feet. FruitMiniature oval melons (about the size of a large grape) look like tiny watermelons and are surprisingly crunchy, with a refreshing tart taste. PruningRemove dying leaves to allow good air circulation when the plants get really thick. PollinatorMale and female flowers on the same vine (like cucumbers) need insects to pollinate. CommentsIts very attractive ornamental vines are ideal for growing on a trellis. Mouse Melons (also known as Mexican Sour Gherkins) are virtually carefree, have good disease resistance, extremely high yields and are extremely easy-to-grow.